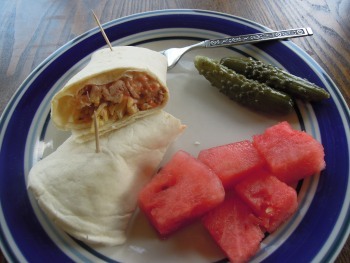 If you are looking for a quick and cool lunch idea, this tuna wrap is great. It’s a little fancier than a plain old tuna sandwich with the addition of some vegetables and shoe string potatoes for crunch. We always have flour tortillas on hand, so we make our wraps with regular old flour tortillas, but you could try some of the flavored wraps that are available, or it would taste great on lettuce for a low-carb wrap too. 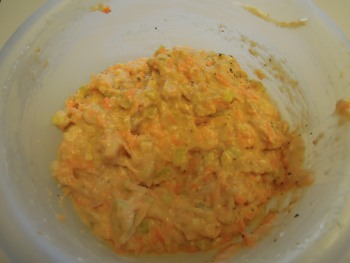 Mix tuna, carrots, celery, onion, and salad dressing until combined. 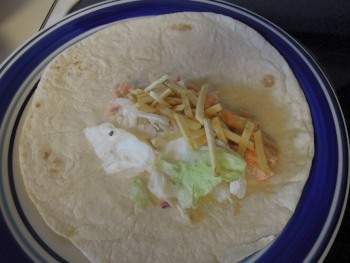 Place a little shredded lettuce in the middle of a tortilla. Add a spoonful or two of the tuna mix to the tortilla. Top with a pinch of shoestring potatoes. Roll up wrap style and secure with a toothpick. The tuna mix can be kept for a day or two, but it will get watery. Just drain off the extra liquid to use the leftovers.